There are many things your company can offer another, but offering everything in the world probably isn’t one of them. So, why are RFP process expectations so high? It’s a sound question for a common problem. Unfortunately, this comes up A LOT in big organizations—spanning verticals from energy to government (and everything in between)—when there are small departments who aren’t aligned in their internal processes. 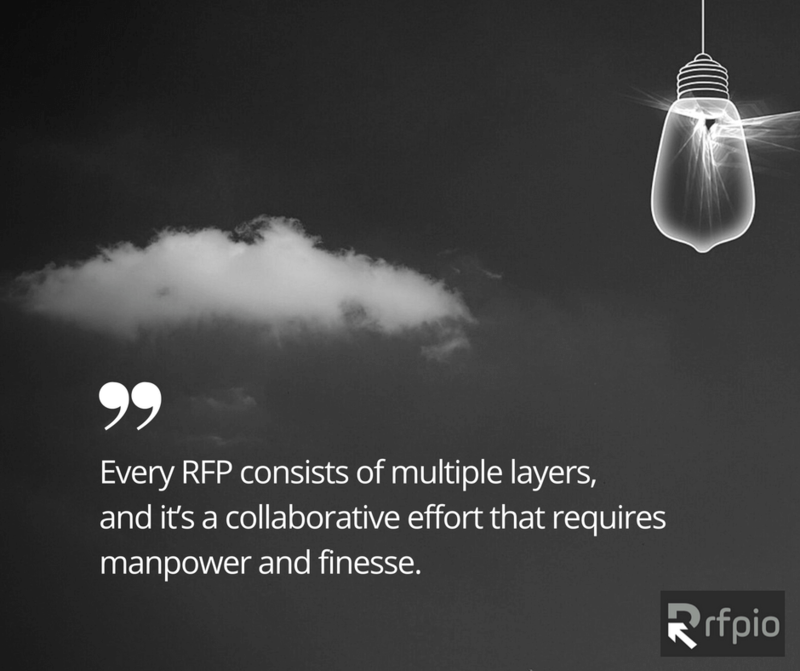 Every RFP consists of multiple layers, and it’s a collaborative effort that requires manpower and finesse. But those efforts are invested with the hope that the deal will close—even when those chances are slim. But sometimes, even when you have the time and resources to respond, an RFP comes along that your company ultimately decides not to respond to. And, that’s because that other company is asking for too much. Another company (who shall remain unnamed) came to us, because they were looking for a better solution to help them manage a specific area of their business. Instead of focusing on solving the problem, they decided to involve different business units to see if they could get all of them into a single software platform. Since each of the business units had competing interests, the RFP was a complete mess. Mainly they were asking for something that didn’t exist. By the end of the call there were only a few vendors left, many of which were overstating their capabilities. To be honest, they were using the RFP process as a means to generate a shopping list. It had nothing to do with evaluating pre-qualified vendors they had researched, with a phone call to know specific answers to outstanding questions. It was clear they just googled a term that brought them to our company and sent out an RFP to anyone they found within that search. It was the perfect setup for an efficiency disaster, one that could have been avoided with a better process. Because none of the vendors can do what this company is asking—except for those claiming they can and are misrepresenting their company—they are in for a wake up call. This company is missing out on good qualified partners that can fulfill what they need, since they are overreaching and asking for too much. Vendors started dropping off a quarter of the way into the call, as they realized the deal was going to be a mess. The wasted time and money, not to mention the all-around frustration, means expectations can not be met. As more departments are added, the wish list grows, as does the number of “mandatory” requirements that no solution can solve in one application. The worst case scenario would involve needing to replace the software suite again in a year or two. Believe it or not, all is not lost for this company. If you’re struggling with a similar situation of asking for the world in your RFP, it’s not too late to change your ways. Do your research. Figure out the specific problem you are trying to solve by creating a list of needs, and ask your team to weigh in to ensure you’re not overlooking anything. Break them down by priority, so you can focus on specific services that will provide solutions for the most pressing needs. Honor your budget. Review historical spend data to compare categories and vendors, so you know what to budget and how you want to divvy it up. While collaboration is good, remember to keep business units to a minimum to control scope creep. Involve only key players that will need to be active on the project. Explore your options. Once you have your priorities, budget, and team defined, create another list for vendor comparison. Check out their website and online reviews to narrow down the list. Before issuing the RFP, talk to potential vendors to decide if they are the best fit for your company without jumping the gun on the process. Aligning your internal processes is a must well before it’s time for the RFP to go out. If you jump the gun, your company will risk not only spending valuable time and resources, you also won’t find the solution you’re seeking. Get your team on the same page and know what the end-goal is. That’s the best way to find long-lasting success, and ultimately a better return on investment for your efforts.